All of you have probably built a house of cards at one time or another. The more creative ones have probably come up with more imaginative card structures like the 3-foot high card Statue of Liberty I built as a 5 year-old kid (Okay, it didn’t look much like the Statue of Liberty and everything looks much taller when you are only five but I had a very vivid imagination). Yes, cards can be pretty fun but add in Skallops and it is like a house of cards on steroids. With Skallops, you are no longer limited to simple house of cards (or even poor replicas of the Statue of Liberty). With Skallops, you get a construction set that rivals even Lego. All Skallops add are wooden half circles with 13 slots for slotting in the playing cards. Pair these with playing cards and a lot of imagination, the sky is the limit. Just do a quick search on Google Image for Skallops and you will be blown by some of the Skallops creations and most of these are the product of young kids. Add in a few other objects like a few pieces of string, you can even build a complex hanging bridge with Skallop cars. And if you really, really want, you can still build a house of cards. 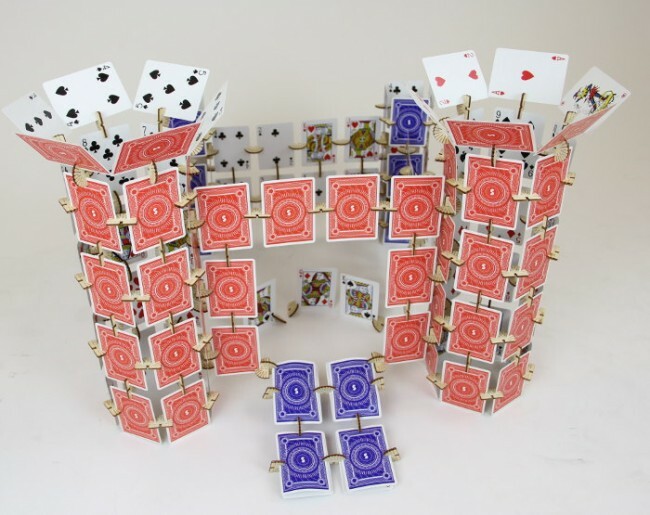 Skallops are laser-cut wooden clips that grip playing cards to build enormous 3D structures by connecting cards together in countless ways.